It’s understandable that FaceBook has a diverse audience. I just wanted to post this to help others who are considering advertisements with FaceBook. I am very thankful that FaceBook has given us tools to promote our practice, but when it has come to advertisements, it has been a bit difficult when it comes to promoting Breast Augmentation. I think perhaps wording could be adjusted in a way that it doesn’t offend FaceBook. I’m in the process of adjusting the ads. I’ve tried about 4 different ads on FaceBook, and they have been rejected. All of them have had the word “breast” in it. I tried to remove the word “augmentation” however that didn’t help. What we wanted to advertise was a free informational session with those who are interested in breast augmentation. Perhaps this is a strange concept. We’re not entirely sure because we’ve not done this yet. FaceBook took a long time to approve the plastic surgery ads which had the word “breast” in it. In the past when I advertised things like Latisse, the ads were approved within perhaps a few hours. But I thought something was strange when the breast augmentation advertisements for Plastic Surgeon, Dr. Tammy Wu in Modesto, CA was taking over 48 hours. On about the third day we were notified that the ads had not been approved. In the past I’ve had rejection of ads before for plastic surgery, but when I’ve written an email to the contact us section in the help files, they would review the ads and then release them, but sometimes that would take a few more days later. I don’t have that luxury this time. But I also think that this wasn’t a mistake on FaceBook’s part, this may be part of a ban against “Breast Augmentation” advertisements. It’s unfortunate in my opinion, as we see Breast Augmentation as a medical and surgical procedure, not something that is as they had quoted as the reasons for the rejection of my plastic surgery / breast augmentation info session advertisements. I’m writing this to let other plastic surgeons and advertisers who work for the plastic surgeons know that this is a potential roadblock from FaceBook, but perhaps choosing different words may help. Meanwhile, I’ll also contact FaceBook, to see if I can learn more about the situation and explain to them our situation and see if they feel any differently. 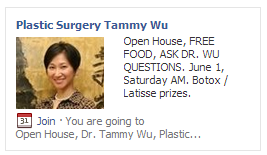 I’d like to be hopeful that FaceBook doesn’t purposely block plastic surgeons and their plastic surgery advertisements. I’ll also find out if this is something new or in response to some sort of religious/public requests that FaceBook is trying to appease. I totally understand that it isn’t easy to please everybody in this world. Stay tuned as I write them back for an explanation – although it will most likely be too late for our Breast Augmentation Info Sessions with Dr. Tammy Wu. There is much for us to learn about the massive world called FaceBook. A day after I wrote the above blog. I finally got one of the ads approved, but I took the words Breast and Augmentation off of the copy of the advertisement, but I didn’t change the landing page which was a facebook event advertising our Breast Augmentation Open House event. At this point, I’m still waiting for FaceBook to respond to my emails regarding my previous ad. Perhaps plastic surgeons need to avoid the words “Breast Augmentation” on their ads from this point on? Thanks for writing in. Your ad was rejected because it violates the targeting policies of the Ad Guidelines. Ads for acceptable adult products (ex: cosmetic surgery and family planning) must be targeted to people 18 years or older. – Before you publish your post, click the target in the sharing tool. – Click Add Targeting and choose one or more of these filters: Gender, Relationship Status, Education, Interested In, Age, Location, and Language. – Click the options on the right side to choose who you want to target your post to. For example, when targeting by gender, Male is automatically selected. Click ‘Male’ and select ‘Female’ to target your post to women’s news feeds instead. – When you’re done adding filters, click Post. I tried to follow the directions and advertise a BOTOX event. However, that Boosted post got rejected again. I’m sending another email to FaceBook to see if they can help me. My overall conclusion is that it isn’t really easy to advertise on FaceBook with Plastic Surgery Ads, even with some expert help from Alan (see above). But perhaps there are other problems. I have noticed that there are other methods of getting to the targeting features on these ads. Join our Surgical Artistry Page on FaceBook. This entry was posted in Breast Augmentation, Cosmetic Surgery, FaceBook, Plastic Surgery and tagged advertising breast augmentation, rejection by facebook on May 26, 2013 by Calvin Lee, MD.